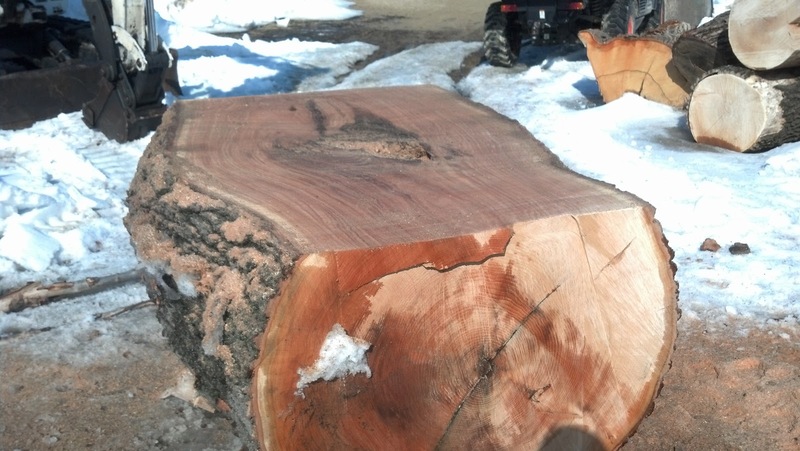 Under the Oak Tree: The slabbing of the Big Oak! Winter has held on here at Arington Tree farm. I had hoped to slab the Burr Oak months ago, but snow plowing has occupied my time. 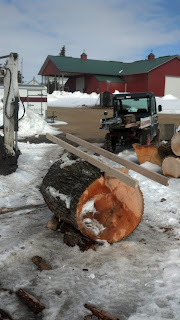 However, with no measurable snow the last few weeks I was finally able to use the new Stihl 880 running an Alaskan chainsaw mill. The photo below shows the slabbing brackets setup for the first cut. From all my prior research, the importance of a level first cut can't be stressed enough. I didn't like the slabbing brackets that were supplied with the kit. They only require two, 2x4's on edge, which is what this photo shows. After a challenge first cut I will be building my own bracket. That will be another blog post. I didn't have anyone available to take an action shot. I'll get Holly or Joe to do that soon. But this second photo shows the log with three slabs removed. At the widest part, the log is 42 inches across. I feel that the scale is hard to appreciate in the photo. We have some ideas of what we want to do with slabs. My next post will show the action photo and what those slabs look like. But if you have any ideas post a comment. I learned that an Alaskan mill is loud, dusty, and creates a lot of vibration. After three cuts I was close to being done for the day. I actually ran out of sunlight, but it was a welcome interruption in the process.